For 5000 years Celts, Romans, Visigoths, and Vikings have each occupied this site, important for its salt production and strategic for its trade route location. It was the Moors, however, who built the impressive castle walls. In 1217 the Portuguese monarchy laid claim to the property, and in 1500 Manuel I of Portugal married the daughter of the Spanish king, Fernando, an important step in preventing hostility between the two rivals over the New World. 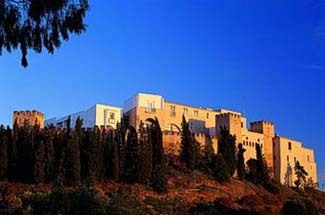 In the 16th century, the castle was converted into a Carmelite convent. Nature lovers will enjoy a stopover in Alcácer do Sal. The marshlands beneath the castle and extending to the west form the Reserva Natural do Sado, a wildlife reserve that provides shelter to white storks, egrets, dolphins, and otters. For those on the way to the Algarve and want a head start out of Lisbon, Alcácer do Sal makes a good stopping point. Alcácer do Sal is 70 km south of Lisbon, off the A2. The pousada is signposted. High on a hill overlooking the Sado estuary, this modern pousada belies the ancient walls that surround it. Decor is minimalist with only the Oriental carpets and the stone and brick walls suggesting a bit of medieval ambiance. Spacious and comfortable guest rooms have whitewashed walls, wood furniture, blue sofa chairs, and Oriental carpets on wood floors. Marble-lined bathrooms are large and modern. Many rooms have small balconies. The pousada’s light and airy dining room overlooks the terrace and features a regional menu with offerings such as lamb stew, mussel soup, and roast pork. Breakfast is ample. Those with young children will find the wading pool a fun diversion.